Please send a donation to help support their work. Before you continue please read this statement. This is not up for discussion. We are the one and only American Orthodox Catholic Church - (short name for) The Holy Eastern Orthodox Catholic and Apostolic Church in North America � that was canonically chartered by the Russian Synod in North America and headed by Archbishop Aftimios Ofiesh. This Church continues today. We are the original 1928 corporation! We thank all those who send inquiries for membership, incardination and ordination to us. As many of you have discovered we are the original and only true American Orthodox Catholic Church and the same Church that the canonical Archbishop Aftimios Ofiesh was appointed to head. He did not, as some would claim, found or start this Church. We will no longer sit by and allow everyone to make these bogus claims that they are us. The original 1928 Corporation of THEOCACNA will fight for the truth. Archbishop Victor won, as co-plaintiff, the lawsuit in Garland County, AR for Defamation and Invasion of privacy (2004). 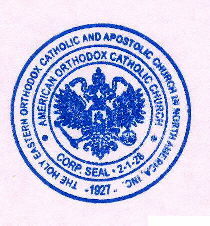 "American Orthodox Catholic Church" short name for "The Holy Eastern Orthodox Catholic and Apostolic Church in North America"� [Registered Service Mark]�. Along with our logo these are our Registered Service Marks. This website contains information about this Historic Orthodox Church, Holy Scripture, The Canons and Tradition. We are the one and only Church that was canonically established by the Russian Synod in North America (Moscow Patriarchate) and headed by Abp. Aftimios Ofiesh of blessed memory. We use the approved Orthodox Liturgy for the Western Rite as published by the Antiochian Orthodox Christian Archdiocese of North America. Our Eastern rite clergy used the approved Eastern Liturgies. We follow Holy Scriptures, the Pedalion which is also known as the Sacred and Divine Canons and Traditions of Orthodoxy. Today while some orthodox claim the canons are only a guide we still view them in the same historical manner as they were viewed in Orthodoxy 100 years ago - as Sacred and Divine. The link above proves we are who we say we are, the original Canonically Chartered Orthodox Church headed by Abp. Ofiesh from 1927 until his death in 1966. We are the First Canonically Established Orthodox Church that was established in and for the New World or North America. 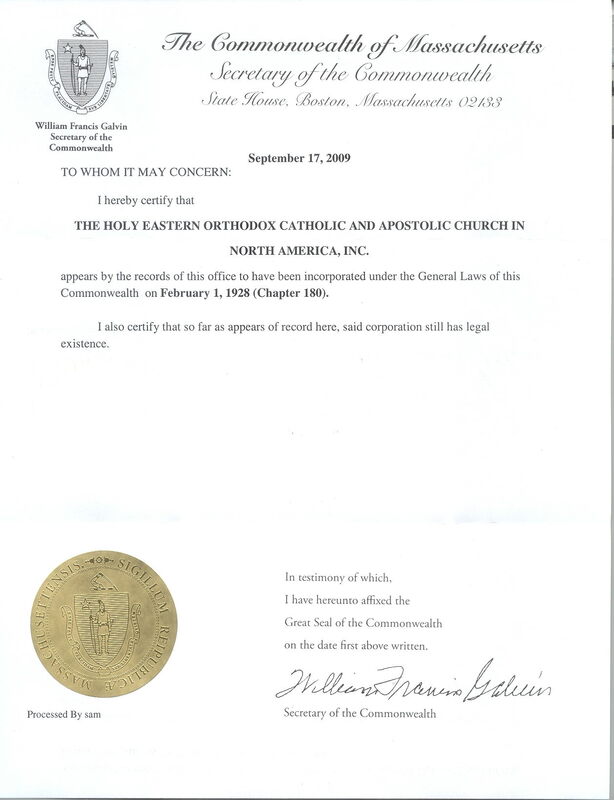 We are the only canonical Orthodox Church in North America in our canonical and rightful jurisdiction. Since the Schism in American Orthodoxy occured in 1929 many have continued to pray with the deposed thus deposing themselves according to c. 11 of the 85c. All their acts today continue outside the true Church. We were chartered Feb. 2, 1927 by the Russian Orthodox Synod of Bishops in North America. They appointed one of their own, the Syrian Archbishop Aftimios Ofiesh to head the new American Church. We were incorporated on Feb 1, 1928 by Abp. Ofiesh. Our names are the legal property (service marks) of this Church under federal law. We are the original "American Orthodox Catholic Church: that was canonically established Feb. 2, 1927 and incorporated Feb. 1, 1928 by Archbishop Aftimios Ofiesh, Archbishop and corporate president. Originally established as the "Anchor Church" for Orthodoxy in the New World, North America, but ignored by the ethnic churches that now make up SCOBA. This was based on the greed of these groups and the desire to be ther "American Orthodox Church... but none but this Church is the one and only "American Orthodox Catholic Church". By their refusal to recognize this Church and Synod these groups have caused a Schism to exist in American Orthodoxy. They show themselves to be unchristian by the false information they publish about us to make themselves look honorable. July 24, 2015 will be the 49th Anniversary of the repose of Archbishop Aftimios Ofiesh of Blessed Memory. All clergy of this jurisdiction must be orthodox and obey the canons. We seek true Orthodox clergy to join our Church and help us grow. We only accept those who have a valid actve ministry. If you are just looking for titles this is not the place. We demand obedience to the Sacred and Divine canons. We welcome inquiries from clergy assigned to one of the old world orthodox churches presently in schism with the American Church. If you seek valid sacramental authority we look forward to hearing from you. If you are Orthodox, follow the teachings, canons and traditions of Orthodoxy and are seeking a new bishop and a canonically established Church home we look forward to hearing from you. Our clergy must sign a clergy declaration. We also welcome inquiries from the Episcopal Clergy who are unhappy with the direction their Church has taken. If you feel we are not a canonically established Orthodox Church please feel free to contact us for some documentation. You may also want to read what the Patriarch says on the Bishops Corner link below. As a canonically established Orthodox Church who is recognized by both the Roman Catholic Church and the Episcopal Church USA we are the closest Church to the old world ethnic Churches available today. We are not a uniate Church and are not under the Pope of Rome. We are under Patriarch Nikon of the American Orthodox Patriarchate. Most non-scoba orthodox today in this country make various claims about their status and recognition but appear to be part of the independent movement. Those who seek to be part of a sacramental Church outside the old world Churches need to look no further. America is our canonical jurisdiction! As the American Church we offer all in doubt, lost or those who have fallen away from their former Church a new home if they willingly submit to the Patriarch & Synod. Therefore, beloved brothers in the Lord, let the order of the Church be observed perfectly among you, beginning and ending always with the commandment � new and divine � that we have received from our Lord and Savior Jesus Christ - Love one another. Everything else that we attempt � even with all our skill and might � will come to naught if love does not reign supreme among us all. The material on the domains are copyrighted 2002-2011 Most Rev. Victor Prentice. No part of this site -- including the content, photographs, logos, or other graphics -- may be utilized or reproduced in any form or by any electronic or mechanical means, (including transferral to other web sites, photocopying, recording, storage in a datebase or other information retrieval system), without express, written permission. All rights are reserved under international copyright conventions.